Chocolate pancakes are a decadent and exciting way to start any day for children and adults alike. Creamy batter is whipped with melted chocolate and grilled to perfection, making a sweet and delicious way to start the day. Top with sliced strawberries and whipped cream for a to-die-for breakfast! In large bowl combine flour, sugar, baking powder, salt, and baking soda. In medium bowl combine eggs, chocolate sauce, milk, and yogurt. Beat together. Add melted chocolate and stir to combine. Stir egg mixture into the flour mixture and stir until just combined. Lightly coat a frying pan or skillet with cooking oil and over medium heat. 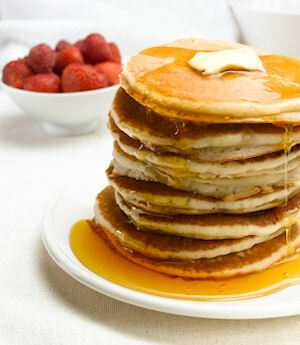 Pour 1/4 cupfuls of batter into pan and cook until pancake begins to bubble on edges. Flip and cook until lightly browned. Repeat until all batter is used, and serve hot.